Now it’s even clearer, thanks to Wikileaks, which kinds of people Hillary’s team deplores — and will treat accordingly, once they wield the bloated powers of the presidency. High up on that list is believing Catholics and evangelicals. Among the 1,000 emails which the trolls at Wikileaks hacked from the office of Clinton’s campaign chairman John Podesta, is one really telling note. In it, Hillary Clinton’s communications director Jennifer Palmieri corresponds with John Halpin of the leftist Center for American Progress. It’s reprinted below. If you were a Beltway political hack, you would get how “friggin” funny it is that Rupert Murdoch had his kid baptized in the Jordan, where Jesus was baptized. What kind of a medieval troglodyte would go in for a gesture like that? 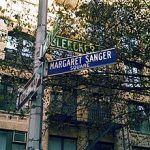 It’s not as if sophisticated liberals venerated sacred places associated with their own revered religious leaders (see Manhattan’s “Margaret Sanger Square”). 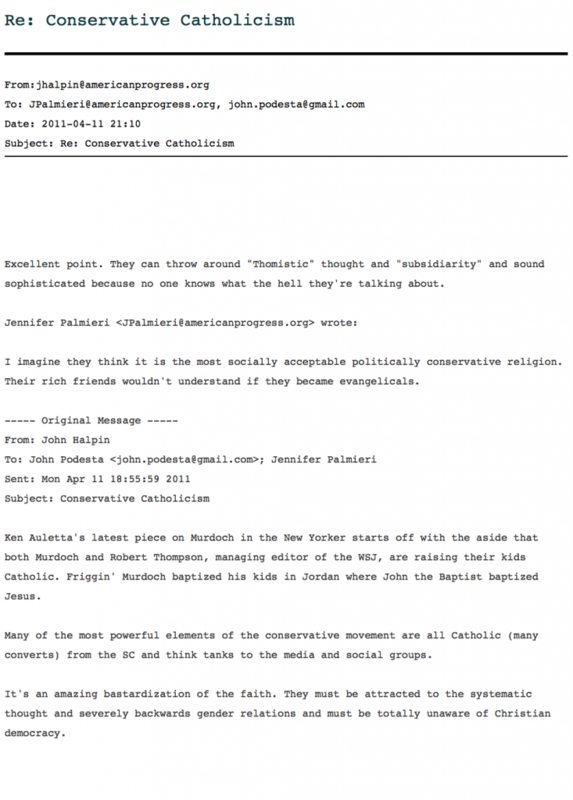 As someone who didn’t convert to Catholicism to impress any rich friends, but grew up in it and fought for it in such hostile environments as a post-Catholic high school and Yale University, let me unpack the Hillary team email just a little. Hillary’s people don’t despise all Catholics. That wouldn’t be fair. It wasn’t Joe Biden’s or Tim Kaine’s fault that their parents decided to baptize them (though not in the Jordan) and plunk them in Catholic school. It was probably just to keep them from getting stabbed in the local, Democrat-run public school. But those good Democrats had the decency not to “bastardiz[e]” the Catholic faith by believing in its central teachings. Let’s leave aside the sanctity of life — since Kaine and Biden did. 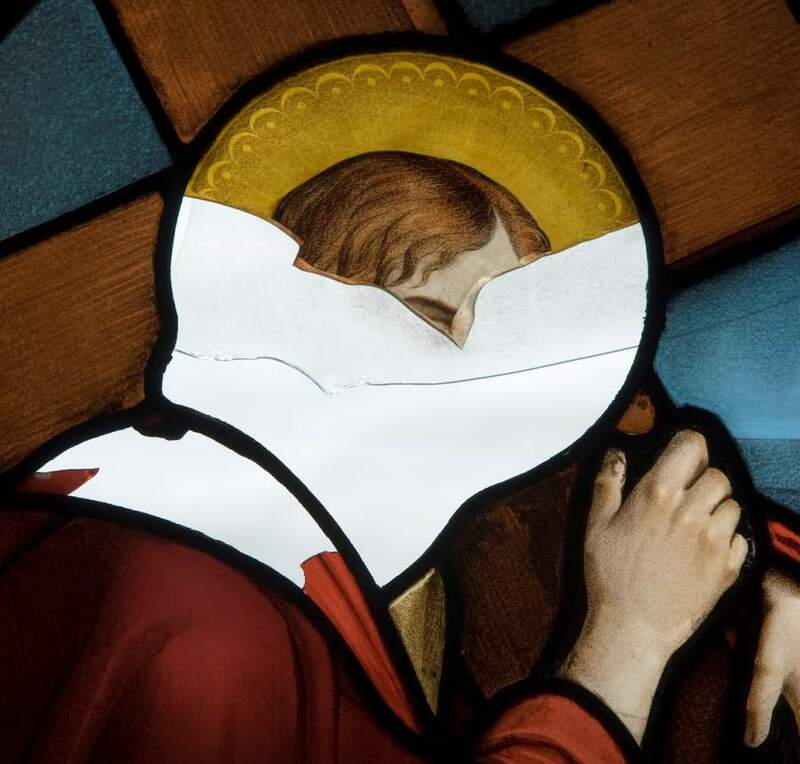 Two of the most crucial points in the Catholic way of understanding the Gospel do indeed entail “Thomistic thought” and “subsidiarity,” and no, it isn’t quite true that “no one knows what the hell they are talking about” on those subjects. In fact, I can explain both in simple, monosyllabic words that even Democrats can understand. “Subsidiarity” says that the U.N. should not run the high school down the street. The White House should not set your town’s tax rates. The best way to run stuff is to let folks who are close to that stuff do it. They know more, and so they make better picks on what to do. Plus, they are the ones who have to live with it, so it’s more fair that way. “Severely backward gender relations” is how mean girls speak of the Church since it does things in old ways. Christ lived in the past, so He did things in old ways, but He would do them our new way if He were here now, since He does what we like and gives us what we want. Whew, that was hard to write. But the effort was instructive. Now I know how to speak, very slowly, to the graduates of Jesuit colleges like Tim Kaine, who have long ago decided that faithful Christians are always wrong, whatever we do: When we speak simply and to the heart, we are snake-handling bigots. When we use philosophical language, we are juggling sophistries to cover some sinister agenda. We are the enemy. We must be stopped. We are Deplorables. John Zmirak is Senior Editor of The Stream, and author of The Politically Incorrect Guide to Catholicism. Makes no difference what is said and by who it is said – I read the back of the book – WE WIN! I would consider it an insult to my character if Hellary or Obama liked me. How right to eschew evil by continuing to refute it. Smaller note: the Jordan baptism is curious. Have Catholics moved from infant sprinkling for baptism? This style and venue are definitely things from the evangelical custom. This strong reaction on this is quite valuable to send a warning shot across the bow that Catholics are watching and listening. Adjust your playbook accordingly liberals!